Science Storytellers has a deceptively simple aim: to sit kids down to interview scientists, using the tools of journalism (and a little gentle coaching by journalist volunteers), and then to share their stories. Not to observe a science demonstration, or hear a spiel, or try out a gizmo or an app—just to talk, one on one, and then to tell science stories. Why the “tools of journalism?” Journalists learn something new every day. The tools they use–asking lots of questions, talking to lots of people, doing background reading, making sense of it all, and communicating it to others—promote what neuroscientists call “active learning,” a kind of learning that is more personally relevant and can lead to long-term retention of information. Journalism also puts science in context, framing science discovery in terms of not just “what,” but also “why” and “how.” When kids approach science as journalists do, ttheir focus shifts from remembering science facts to recognizing the relevance of science to everyday life. Why *does* this matter? Why *should* I care about this? How *did* you figure that out? Science Storytellers gives kids some scaffolding, a set of questions a journalist might ask a scientist—and in our experience, those questions quickly lead to an engaging conversation between kids and scientists alike. But the real motivation behind Science Storytellers is that creating the time and space for kids and scientists to simply talk to each other helps kids see that scientists are people just like them. Science Storytellers builds on a solid research base showing that the one-way delivery of science information from “expert” (whether scientist or science communicator) to “non-expert” does little, if anything, to challenge misconceptions, inform public opinion, or simply increase science learning. This research on the so-called “deficit model” has led to real changes in the way many practitioners approach informal education in particular. 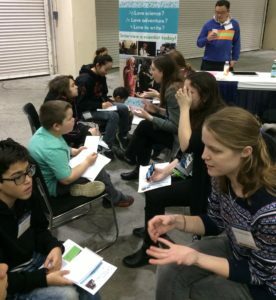 Many people suggest that science communication and informal science education can be more effective in increasing science literacy when it involves a two-way exchange of ideas. A two-way exchange of ideas sounds to us like the definition of “conversation.” And with Science Storytellers, that’s the kind of exchange we’re trying to promote, one kid, and one scientist, at a time.